I was certain I was about to fall to my death. There is a new indoor rock climbing wall at the Glen Park Rec Center here in San Francisco. You know, the 30 to 40 foot gymnasium walls strewn with multi-colored, bolted-in climbable cracks, rocks and arches for safety harnessed climbers to ascend to the top and live out their bouldering dreams. On a recent rainy day, I went there with my wife and children. I put on my helmet, strapped on my climbing harness, attached my carabiner to the rope, looked up at these multi-colored rocks lining the climbing route and yelled “On beley!” to the attendant to get started. And even though this was my first time ever rock climbing, I expected to climb straight up all the routes and impress myself, my family and other onlookers watching below. I mean, how hard can this rock climbing thing be? I’m in pretty good shape. It’s like going up a ladder, right?! Well, I was in for a hard truth. Rock climbing isn’t that easy. It requires muscles I hadn’t used in a while, causing my arms to instantly burn and tire. My form was not good at all, making it difficult for me to effectively grab the rocks. The top portion of the wall sloped towards me, an overhang angle that made climbing that much more difficult. And I also conveniently realized that I had until then a dormant fear of heights: Defying all logic, I didn’t yet trust the safety cable harnessed to my body, causing me to be too cautious and timid and scared. I made it down to safety, but not after freezing for what seemed like hours 30 feet above the ground. A newbie like me heard rock climbing was possible and thought it would be easy. But it didn’t work out that way that day. But someone who has rock climbed even a handful of times before knows what to expect, what fears to overcome, which routes to focus on and what preparation is best. So, after being unable to reach the top of the wall during my first few attempts, I pulled one of the attendants aside and he graciously gave me some pointers. He also watched and shouted out tips and guidance as I climbed. I am happy to say, with his help, I then successfully made it to the top of the wall. Training to leave the law for an alternative career is similar. As an unhappy attorney exploring the idea of leaving the law, you may sometimes get the impression that it can be almost effortless to land that “non-law” job. Or you may be hesitant or embarrassed to ask for help, and try to do it all on your own. But then when you have trouble overcoming the fears you have in leaving the law … when you hit a blocker in writing your “non-law” resume and cover letter … when you can’t seem to set up the right informational interviews, you can then get frustrated and mad and discouraged, and you likely start to feel that your happy, joyful life is actually very far away. You don’t know how to leave the law, you feel all alone, and you get overwhelmed by the difficulties. And then you stop and remain stuck. Whenever you start something of meaning and importance, it is not easy. But if you can receive some training, it will get easier little by little. The more you train at something, the better you become, and the easier it gets. The Buddhist monk Ajahn Chah said training is like making a path through the forest: First, the forest is hard to clear, there is a lot in the way, trees, and stumps, and roots and rocks. But as you keep at it, you clear more and more, until you have a smooth, packed, stable path from being cleared and walked on repeatedly. 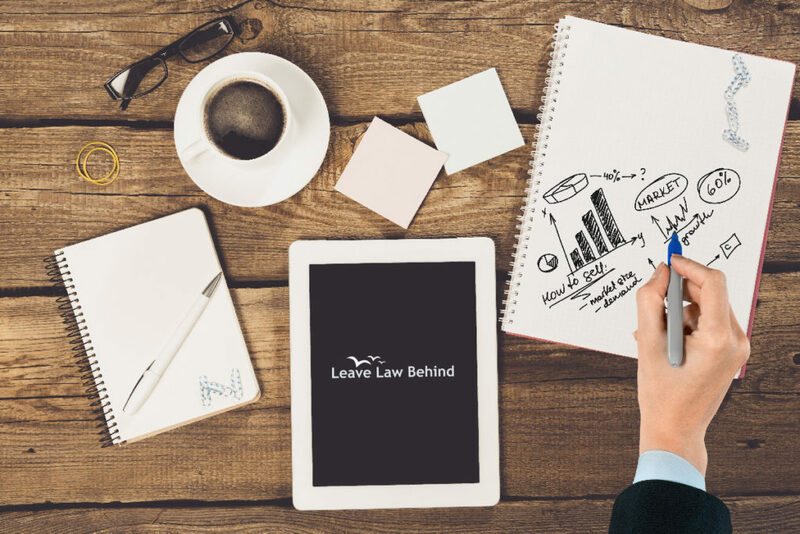 This is what it’s like when we train you here at Leave Law Behind. I have created a step-by-step coaching program that teaches attorneys who want to stop practicing law how to find and land their dream, “alternative” career through a 5 step training process. You start as an overwhelmed, unhappy lawyer stuck in an attorney job with no hope for being happy … and train in order to transform into a person living your ideal life in a thriving career with meaning and purpose. 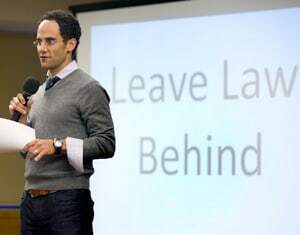 If you think you’re ready to start your training to leave the law, click here to sign up for a free consultation call to learn more and speak with me. You can leave your practice and find an “alternative” career that you love and supports your lifestyle. 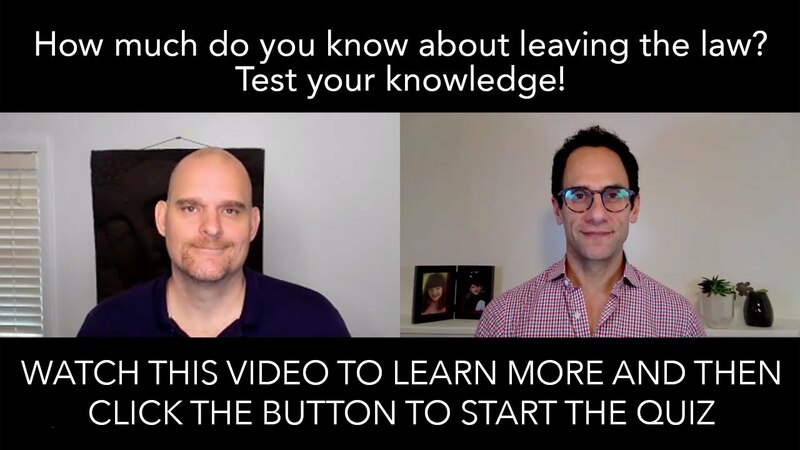 Begin by taking Casey’s “How Much Do You Really Know About Leaving the Law?” quiz to see if leaving your practice is right for you. Start the quiz by clicking here.